During the seventh century, the North Sea region became a vibrant economic area. In the second half of the seventh century, silver coinage (commonly called ‘sceattas’ or ’deniers’) began to appear in northern Europe and Scandinavia. Their distribution is shown on the map on the right. 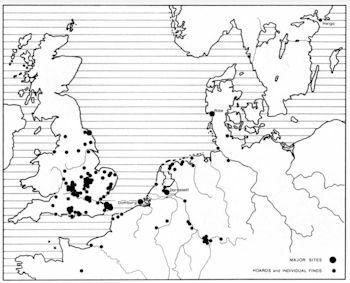 Around this time, settlement sites known to archaeologists and historians as ‘emporia’ or ‘wics’ began to appear around the North Sea coast and in Scandinavia. They seem to have been specialised trading settlements involved in international trade in luxury goods and sometimes showing evidence of a heavy concentration of crafts such as metal working, bone and antler working, and minting.